LONDON--(BUSINESS WIRE)--According to the latest market study released by Technavio, the global radar sensors market is expected to grow at a CAGR of close to 16% during the forecast period. This research report titled ‘Global Radar Sensors Market 2017-2021’ provides an in-depth analysis of the market in terms of revenue and emerging market trends. This report also includes an up to date analysis and forecasts for various market segments and all geographical regions. “Radar sensors play a significant role in industrial applications where safety is paramount. In addition, they can be used for reliably sensing the presence of humans and objects in different industries in all possible environmental conditions. Another important industrial application of radar sensors is in gas flow metering and for the measurement of bulk solids in pipes or tanks. They are also used to measure the volume flow for the conveyor belts,” says Rohan. 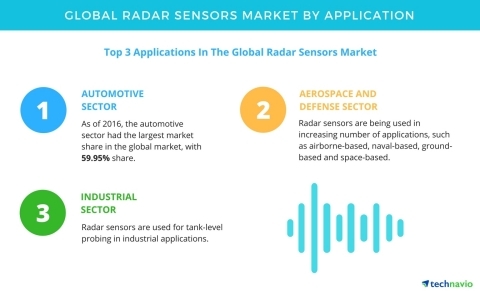 According to the latest market study released by Technavio, the global radar sensors market is expected to grow at a CAGR of close to 16% until 2021.